I attended the recent Earned Paid Sick Leave hearing in front of the Portland City Council. I’d like to supplement your coverage of the hearing (see here) so that readers better understand the issue. First, large employers’ concerns about losing their PTO policies are unfounded. The Portland ordinance allows businesses to enact an equivalent PTO policy. To quote section 35-2(h): “If an Employer provides paid time off to employees under a PTO, vacation or other policy that complies with [the EPSD ordinance], the Employer is not required to track and keep a separate record of accrual and use of earned sick time”. Second, your article failed to convey the magnitude of grassroots support for this ordinance. On April eighth, fifty people testified in support of the ordinance, and only ten in opposition. Supporters were workers, parents, small business owners, and union members. Having watched over fifteen months of deliberation, we are ready for the council to vote on this important public health measure. Testimony at the previous two hearings suggests that Portland voters care about Earned Paid Sick Leave. In November, we will remember those councilors who, without regard for public opinion or public health, decided to “wait for the state”. In October we launched our campaign against the 1115 MaineCare waiver, because these attacks on MaineCare will move us further away from our vision of a universal, publicly funded health care system. Yesterday, the federal Centers for Medicare and Medicaid Services (CMS) approved Maine’s 1115 waiver application, paving the way for thousands of Mainers to lose their health care coverage. Just as we are finally poised to win MaineCare expansion, the LePage-appointed DHHS administration continues advancing its agenda to dismantle MaineCare. We are committed to stoping the implementation of the waiver, and to building a powerful movement to win a health care system based on our human rights, not corporate profits. Read our press release about the approval below. 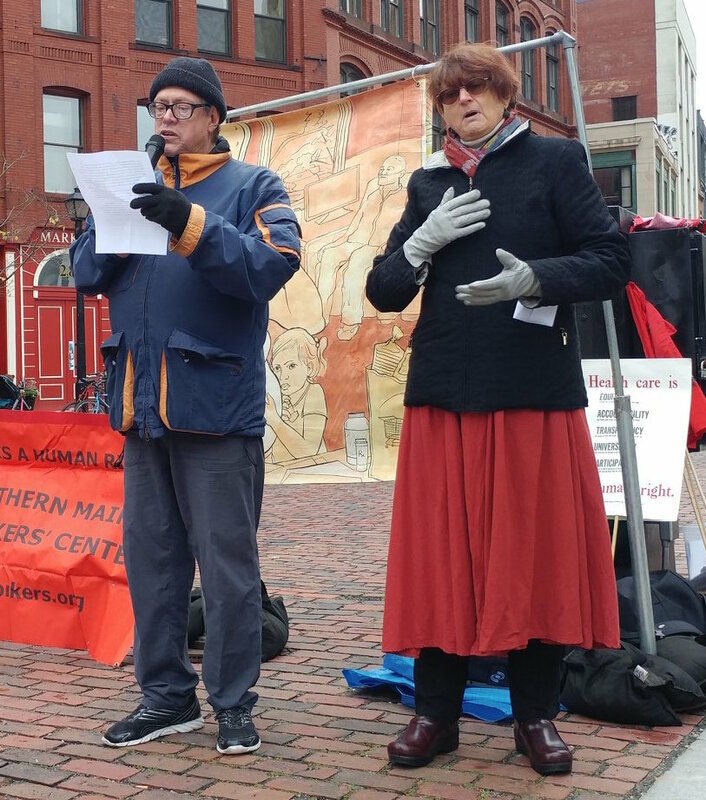 Portland, ME: The Southern Maine Workers’ Center and coalition partners are committed to stopping implementation of Maine’s 1115 Demonstration Waiver, approved Friday, December 21st by the Centers for Medicare and Medicaid Services (CMS). If implemented, the 1115 Waiver will fundamentally restructure MaineCare, stripping many people of their access to care by creating deadly bureaucratic and financial barriers. In Arkansas where similar measures have been implemented, thousands of Medicaid recipients have lost coverage. 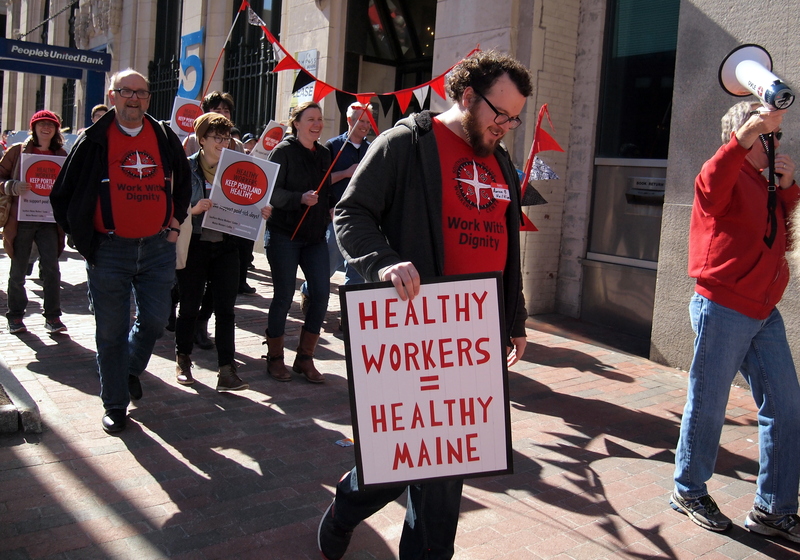 On October 28, The Southern Maine Workers’ Center launched a campaign against the waiver, and has been organizing Mainers who would be impacted by the changes. DHHS misleadingly portrays the 1115 waiver as a way to incentivize work in order to distract from its aims to cut access to healthcare, stigmatize low-income people, undercut both MaineCare and the Affordable Care Act, and transfer resources from poor people to corporations and the wealthy. In addition to punitive work requirements, the changes would include new cost burdens, premiums, penalties and fees, asset tests, fines for missed appointments, and burdensome, expensive paperwork. For more information about the campaign against the waiver, contact Workers’ Center member Meaghan LaSala: 973-862-7105, meaghan.lasala@gmail.com. The Southern Maine Workers’ Center is hosting its biggest grassroots fundraising event of the year, and we need your help! On Saturday, February 9th at 8pm, SMWC members will be gathering at the Apohadion Theater in Portland to sing their hearts out and raise money to support the core programs of SMWC, from the Workers’ Rights Legal Clinic to our organizing against Medicaid work requirements to our political education work in the community and more! It’s kind of like raising money to run in a road race…except your road race is a night of karaoke! Each person will commit to raising a certain amount of money. For the month ahead of the event, you’ll use an online fundraising platform to make a personalized page to tell your community why you are raising money for SMWC. Using social media, personal emails, or in person asks, you’ll be inviting people you know to donate to SMWC. To make it fun you can promise to sing an embarrassing song at karaoke or offering to let your highest donor choose your song. Members of SMWC fundraising committee will be available to support you to set up your page or think about how to meet your goal. 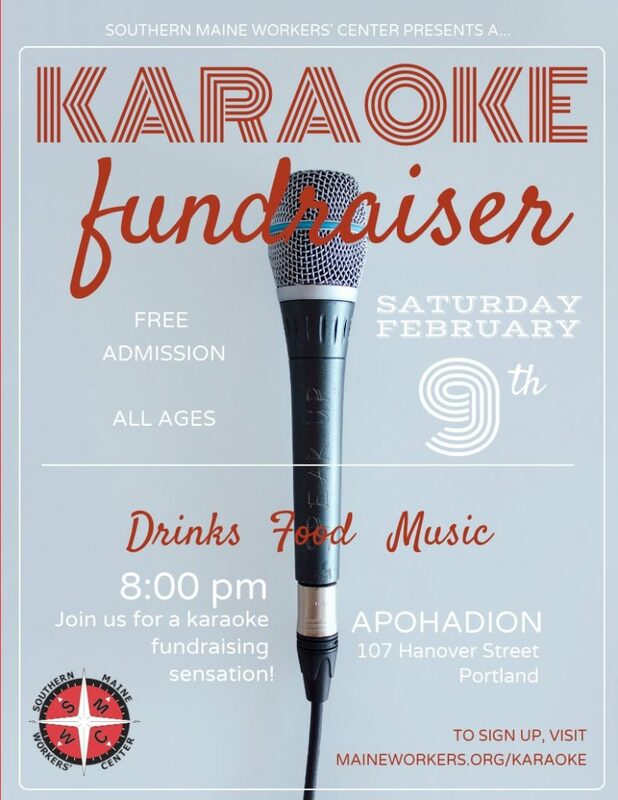 To celebrate our success, we will participate in a super fun, really sweet night of karaoke singing with the broader SMWC community on Saturday, February 9th, at the Apohadion Theater in Portland at 107 Hanover Street. There will be drinks, food, and lots of charming singing. We promise. We have set a goal of raising $10,000 with this event. This is our biggest fundraising goal EVER! It’s going to take a collective member effort to make sure we realize it! What if karaoke is my worst nightmare? You can still sign up to raise money and just attend the event. This is a consent-based model: no one has to do karaoke if they don’t want to! Just tell one of the Fundraising Committee members you want to do it, and we’ll send you a link to the fundraising platform. You can talk to: Jo Bell, Sue Bragg, John Ochira, Jan Bindas-Tenney, Nicole Manganelli, or Drew Joy. We’re so excited!! THANK YOU! For LGBTQ+ young people, access to affordable, comprehensive, low-barrier healthcare is a lifeline. Good afternoon! My name is Osgood and I’m the Director of Portland Outright. As an organization by and for low-income LGBTQ+ people, Portland Outright’s work is inextricably linked to the work of organizing for the human right healthcare. Every time Outright youth leaders organize–for better access to healthy foods for incarcerated youth, for the right to live in safe housing, for trans-competent healthcare providers–this is the work of healthcare justice. For LGBTQ+ young people, access to affordable, comprehensive, low-barrier healthcare is a lifeline. We see the work of advancing health equity for marginalized communities as integral to ending youth incarceration and youth homelessness. Lack of resources and barriers to good health perpetuate the criminalization of LGBTQ+/GNC youth. As an alternative to incarceration, LGBTQ+ youth need therapeutic, holistic, trauma-informed, community-based care and healing. Outright is an LGBTQ+ youth-led movement whose aim is to achieve this vision of health and equity for our communities. Recently, the Trump administration announced plans to roll back the basic rights of Transgender people–hard won victories which protect trans people’s right to self-determination, to healthcare and to safe housing, to be safe at school and at work. Since that time, communities around our country have suffered brutal attacks on their safety and lives–in community spaces and in public. We also know that acts of state violence–including the state violence which drives cuts to MaineCare, including the changes proposed in the 1115 Waiver –disproportionately impacts people of color, queer and trans folks, and low-income people in our community. That this kind of systemic violence is a tactic used to keep us divided, to stop us from building the collective power needed to transform our communities. When the state creates scarcity–in services, in resources, in care–there have always been community networks that open their doors and pick up the slack. We draw power from and model our programs after generations of trans people living in the margins who created deep abundance and rich networks of support from very little. It is in this tradition that we understand youth organizing and anti-oppression work as an act of love. We must continue to organize and to take care of one another, because this is the key to our survival and creates the blueprint for the world we are building together. Our healthcare system should reflect the vision and values that are present in the work we do together everyday–interdependence, healing, justice. Now, more than ever, we must organize boldly and broadly towards the world we know is possible. On Sunday, October 28th, the Southern Maine Workers’ Center held the Rally to Protect and Expand Access to Health Care. The rally connected the dots between the well-known issue of MaineCare expansion, which, while passed by voters has still not been implemented; lesser know attacks on our health care system, including the proposed Section 1115 Waiver which would create, among other things, job requirements for Medicaid; and the growing momentum in a nationwide call for Medicare for All. 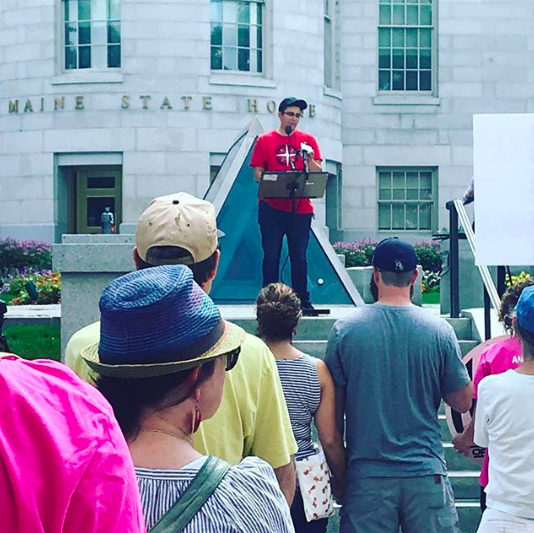 We’re sharing some of the powerful speeches from the rally so they continue to inspire the health care is a human right movement in Maine. Now is the time to hold our newly elected officials accountable to enact their promises to improve health care. Please let your representative know that you opposed the proposed changes to MaineCare in the 1115 Waiver. Please let Governor-elect that in addition to implementing the medicaid expansion, we need her to rescind the 1115 Waiver! Hello, my name is Mark James. I’m a grateful MaineCare recipient. I’m grateful because without it I would be dead. I wasn’t working when I was diagnosed with Non-Hodgkin’s lymphoma the first time. I knew if I hadn’t had MaineCare I would probably have died. It all happened so fast. I was living in Aroostook county, in rural northern Maine, where there are not a lot of jobs. The MaineCare 1115 waiver and proposed work requirements do not consider geography, or the fact that many people go without work because there is none to be had. Health care shouldn’t be equated with how many good paying jobs there are in your region of the state. These waiver requirements are set up to discriminate against the working poor, and find ways to kick people off MaineCare. These punitive work requirements don’t take into account people who work hard taking care of loved ones, which is generally unpaid. I know, because I was a full-time caretaker for both my mother, and my partner of 27 years. When you are caring full time for a loved one, you don’t have time to constantly fill out paperwork. The paperwork associated with these work requirements is costly bureaucracy, and will lead to many people who should be exempt still losing their coverage because of new barriers they have to overcome. Not to mention, if you miss a premium, fee or co-payment, they could kick you off your MaineCare after just 90 days! So, if you’re working poor and you get sick and can’t pay the premium, you’re screwed either way. They say this is to incentivize work. I say these requirements are set up to kick working poor people off MaineCare. These policies are setting people up for failure. This does nothing to move us towards our goal of universal health care. It’s another war on the poor to discriminate and humiliate people. That is why I am glad to be part of a movement that sees people’s humanity. We need universal healthcare now, because Health Care is a Human Right! Together we will create a future where everyone has the health care they need and deserve. On Sunday, October 28th, the Southern Maine Workers’ Center held the Rally to Protect and Expand Access to Health Care. The rally connected the dots between the well-known issue of MaineCare expansion, which, while passed by voters has still not been implemented; lesser know attacks on our health care system, including the proposed Section 1115 Waiver which would create, among other things, job requirements for Medicaid; and the growing momentum in a nationwide call for Medicare for All. We’re sharing some of the powerful speeches from the rally so they continue to inspire the health care is a human right movement in Maine. Mainers know that access to affordable health care is a basic human need, no matter our race, gender, background, or how much money we have. That’s why we came together to expand Medicaid at the ballot box last November. Voters across Maine understood that expanding Medicaid, also know as MaineCare, is a commonsense fix to get health care coverage for 70,000 more people in our state. It’s also why we’ve stood up to protect the Affordable Care Act time and time again. Governor LePage has actively fought against Mainers’ access to this life-saving health care for years and continues to do so today. Despite 59 percent of voters casting a vote for expansion, he has used his power to try to block the will of Maine people by delaying over and over again the implementation of this new law. He will not succeed. We haven’t stood idly by. Together with partner organizations and the support of people who need this coverage, we have taken to the courts to force the LePage administration to follow the law, we worked to pass the funding he claims to need in the legislature – funding he then vetoed. Our family, friends, and neighbors need to be able to get health care and we won’t stop fighting until they do get it. At the federal level, we continue to face attacks on the Affordable Care Act. And, the Trump administration is eager to add barriers to state Medicaid programs through the 1115 waiver process – even though a federal judge already found that barriers like job requirements are in opposition to the statutory purpose of the Medicaid program which is to serve the health and wellness needs of our nation’s families and individuals with limited incomes. Should Maine’s 1115 waiver be approved, we will fight that as well. Those politicians who want to reduce access to health care have shown time and again that they will use hateful rhetoric to divide us—often blaming poor people, immigrants, and people of color for the problems with our health care system. The reality is that our economic system and our health care system do not work for people with low incomes without programs like Medicaid. Low-wage jobs without health benefits, the gig economy, discrimination, and our broken immigration system make it difficult if not impossible for many people to gain financial security and get the medical care they need and deserve. It doesn’t have to be this way. When we join together across our social, economic, and racial differences, we win. Every person in our state deserves access to high quality, affordable, and comprehensive health care. Every one of us. We can make a difference by sharing our stories with our personal networks as well with the media and policymakers. We can make a difference by electing champions for health care who share our values. We can make absolutely make a difference by voting on Nov. 6th just like we voted to expand Medicaid last year. We’re asking Mainers to pledge to be a health care voter and we launched a website to make sure voters have the information they need before they go to the polls or vote early by absentee ballot. You can make the pledge and get more information at healthcarevoter.me. 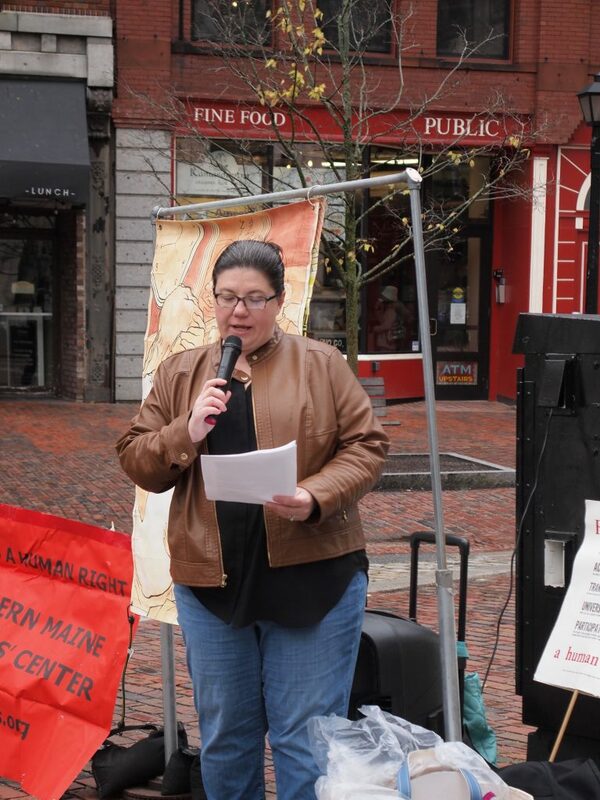 Portland, ME: While thousands of Medicaid recipients in Arkansas lose their health coverage due to punitive work requirements, The Southern Maine Workers’ Center (SMWC) is launching a campaign to stop similar attacks on MaineCare. On Sunday, October 28 at 1:00 p.m. in Monument Square, SMWC along with a coalition of supporters will Rally to Protect and Expand Health Care. (The rally, originally planned for Saturday, was postponed to Sunday, October 28 due to weather). The rally will feature testimony from MaineCare recipients, and amplify broad public support for universal, publicly funded health care in the lead-up to midterm elections. Mainers overwhelmingly voted to expand MaineCare access, and over 83% of Mainers surveyed by SMWC support universal, publicly funded health care, but DHHS is denying the will of the people by attempting to undemocratically dismantle MaineCare using an 1115 Waiver. If implemented, the 1115 Waiver will fundamentally restructure MaineCare, stripping many people of their access to care by creating deadly bureaucratic and financial barriers. The Southern Maine Workers’ Center is committed to organizing everyday people across Maine to secure a universal healthcare system that guarantees healthcare to all residents, and will resist these changes that would move Maine in the wrong direction. 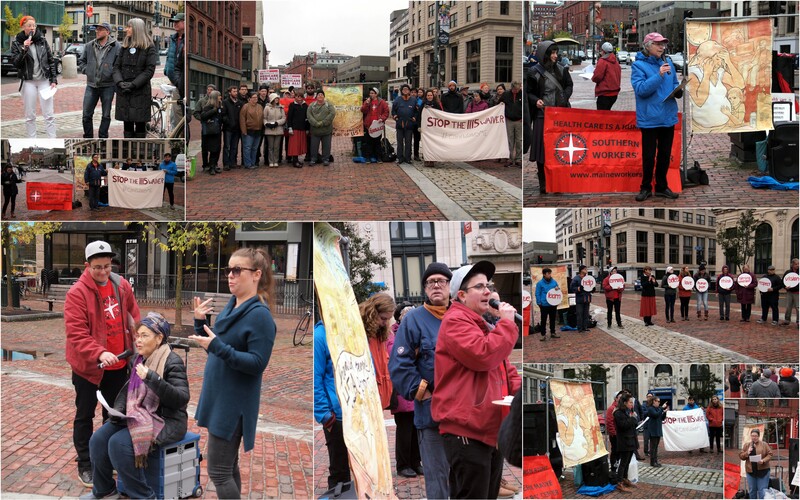 The rally is co-sponsored by Maine AllCare, Maine Health Care is a Human Right, Maine Inside Out, Maine State Nurses Association, Portland Outright and Portland Overdose Prevention Site (OPS). DHHS misleadingly portrays the 1115 waiver as a way to incentivize work in order to distract from its aims to cut access to healthcare, stigmatize low-income people, undercut both MaineCare and the Affordable Care Act, transfer resources from poor people to corporations and the wealthy, and undermine Mainers’ commitment to taking collective action as a state to meet our shared needs. The following stipulations, along with the expensive and burdensome bureaucracy that they would require, would devastate many of the poor and working class Mainers who rely on access to MaineCare. People on Medicaid would be required to continually submit paperwork proving where they work and how many hours a week they are employed. But Mainers do all kinds of formal and informal work, like working multiple jobs and providing unpaid caregiving for loved ones that would be hard to document and in many cases wouldn’t qualify as “work” under these rules at all. We should get healthcare based on our medical needs, not on how much money we have or whether we happen to be employed. No one “deserves” to be denied healthcare. The waiver would place new cost burdens on people that would make it hard if not impossible for people to get care. Everyone enrolled in MaineCare would be denied care until they are able to come up with money to pay premiums and copays, and if they ever miss a payment, they can be kicked out of MaineCare after just 90 days. Anyone who has more than $5,000 in savings would be kicked out of MaineCare. This will deny people healthcare and prevent people who really need to stay on MaineCare from being able to save even basic emergency funds for their families. Low income Mainers should not be forced to choose between building a modest savings and their healthcare. Poor and working class people often have limited transportation, inflexible bosses, medical conditions, and other challenges that make it hard to get to appointments. Instead of helping people make their doctors’ appointments, the waiver would punish patients by allowing providers to charge patients for any appointments they miss. To stay eligible for MaineCare, people would be required to fill out endless paperwork documenting that they are following all of these rules. If they can’t figure out or keep up with all the paperwork, they will be kicked out. For further questions, please contact Meaghan LaSala at the Southern Maine Workers Center at 973-862-7105. We’re hiring a part-time Administrative Coordinator! This is an hourly, part-time position for 16 hours a week. Compensation is $15/hr. The position will be focused on administrative work and volunteer coordination and will be based at SMWC’s office in Portland. Send your resume and a cover letter to smwcemployment@gmail.com. Applications are due by November 1st. The Administrative Coordinator will provide ongoing support in the areas of office administration and volunteer management that are essential to the smooth operation of the Southern Maine Workers’ Center as a community-based organization powered largely by volunteer members. The Administrative Coordinator will be responsible for the day-to-day administrative tasks required to run the Southern Maine Workers’ Center, coordinating the administrative needs of SMWC’s member-led committees, and recruiting and supporting administrative volunteers. Managing the info@maineworkers.org email account and fielding general inquiries about SMWC or forwarding to relevant staff or member-leaders. This position is for 16 hours a week. We Believe Survivors. We Know our Rights are at Stake. 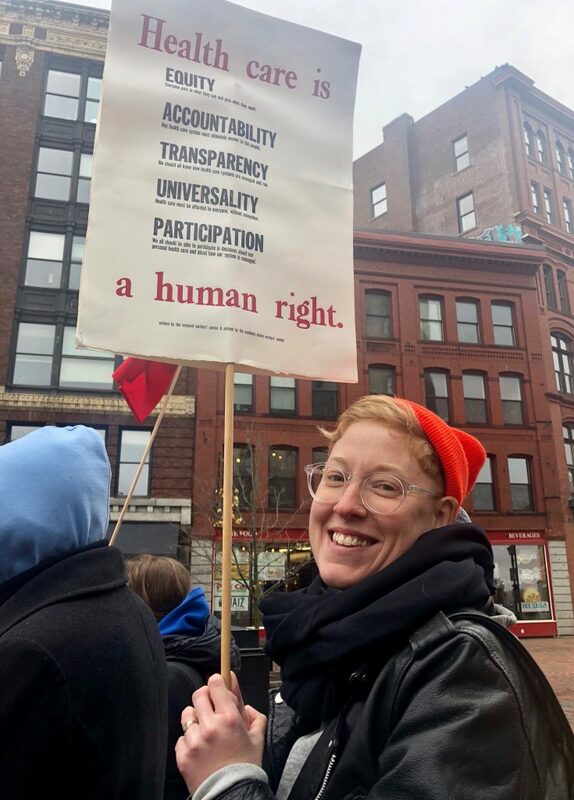 The Southern Maine Workers Center believes that all people are entitled to basic human rights that meet basic human needs. Our work is to secure these rights: to ensure that all people have work with dignity and access to the health care they need. We make progress every day, but we know that our rights are at stake with the nomination of Judge Brett Kavanaugh to the Supreme Court. We know that Kavanaugh will use his position to undermine basic human rights through ideological misinterpretations of the law. We unequivocally oppose his confirmation on several fronts. First, we believe survivors and we believe Dr. Christine Blasey Ford. We know that as perpetrator of gender-based violence, Kavanaugh is not fit to serve on the Supreme Court. Additionally, this confirmation process is demonstrating that some of our elected officials don’t care about the experiences of survivors of sexual assault, which impacts the well-being of women, and survivors of all genders, in our membership and beyond. And while Kavanaugh’s conduct alone is enough to deem him unworthy of a seat on the most important judicial body in the United States, we also know that Kavanaugh’s positions on numerous issues are a direct attack on the lives of our members. Second, we know from his D.C. Circuit court record that Judge Kavanaugh will actively work to revoke the already limited protections workers currently have. We’ve seen from his rulings that he sides with big business over workers. We know that he is hostile to unions, hostile to the the rights of workers to sue their employers, and even hostile to the idea that workers should have safe working conditions. We can anticipate less ability for workers to address other injustices in the workplace—whether that’s discrimination, sexual harassment, unsafe conditions, or better wages. Maine’s working people, who Senator Collins claims to respect and represent, would be deeply harmed by her vote to confirm Judge Kavanaugh. Third, we know from his record that Judge Kavanaugh has no respect for the human right to health care and could cast the deciding vote in cases that would undermine access to life-saving care. We’ve seen from his rulings that he will work to undermine the Affordable Care Act (ACA) and the right to comprehensive reproductive health care, including abortion. As governors across the country, including in Maine, attempt to block Medicaid expansion in their states by passing punitive job requirements and premiums on very low-income people, we can expect Kavanaugh to align himself with right wing ideology, rather than the mission of the Medicaid program. Senator Collins has played an important role in protecting the ACA, but confirming Kavanaugh would undermine the stance that she took on that issue: betraying her constituents, in addition to being reckless with human lives. Finally, we know that the conservative agenda cannot be separated from systemic racism and misogyny. Kavanaugh’s record makes clear that he will make decisions that further institutionalize and legitimize xenophobia and racism and attempt to undermine the humanity of immigrants and people of color. We believe in the worth and dignity of all people. We know that the justice and court systems do not currently serve all or protect all people. We know that we can not allow further degradation of our human rights by allowing Judge Kavanaugh access to the Supreme Court. We believe that Senator Collins has a conscience. It remains to be seen if she will follow it.